studied with Prof. Dr. Thomas Offermann and Prof. Jens Wagner at the Universities of Music in Berlin and Bremen, Germany and also persued post-graduate studies at the “Centro Chitarristico ” F.Tarrega” in Pordeone, Italy with Prof. Paolo Pegoraro. In addition to her guitar studies she has been a member of the internationally acclaimed Youth Radio Choir and chamber choir Wernigerode as well as the international prizewinning Vocal Consort Weimar. She has also participated in masterclasses with Roberto Aussel, David Russell, Hopkinson Smith and the reknown New York pianist, Seymour Bernstein. 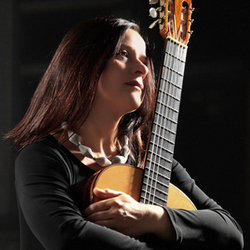 She was a prizewinner at the International Guitar Competition for classical guitar in Cracow, Poland in 1994. Pia Gazarek Offermann has performed throughout Europe, Asia and North and South America. She currently lives in Berlin and is on the teaching staff at the University for Music and Arts, Bremen. She is a frequent guest tutor at international universities, e.g. as Artist in Residence at Mount Royal University Calgary in Canada and jury member at international competitions. Pia Gazarek Offermann’s debut solo CD ” Satyagraha” published in 2007 by AureaVox, www.aureavox.de, has been highly praised by press and public alike. Her solo CD „Spanish Guitar Masterpieces“ published in 2013 by AureaVox has already gained highly international appreciation. Since April 2010 Pia Gazarek Offermann is an official D’Addario Artist.